Poshed-up version of the more plain LL16 ARE, offering stunning spec for very sensible money. Very impressive, balanced tones. Supremely playable. Quality build and components. Excellent value. Apart from the abalone, however, it's otherwise the same as the solid rosewood back and sides LL16 ARE model (and the same price). All the new 6 and 16 Series guitars get a solid Engelmann spruce top, treated with Yamaha's ARE process, previously available only on the (Japanese-made) 26 Series guitars and up. The company goes into plenty of detail in its marketing materials about ARE, claiming that by manipulating temperature, humidity and pressure at a 'sub-cellular' level, the spruce's molecular structure is changed to be closer to what it would be after many years of playing and use: it's 'played in', 'older', or however you want to term it. 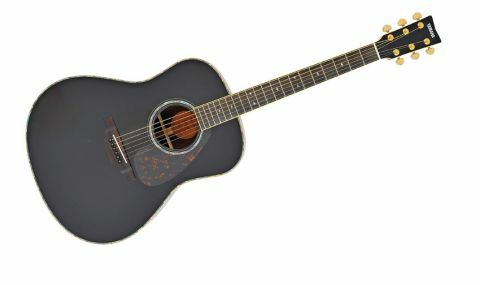 Easier to understand is the new, lower-profile, non-scalloped X-bracing structure that Yamaha has developed to increase volume and improve bass response over previous models, though by nature the LL body (developed from Yam's FG modified dreadnought shape from 1966) was designed to be less 'boomy' than the fabled Martin D. 'Well balanced' and 'sits easily in a band mix' is the sort of territory Yamaha is shooting for. 16 Series instruments have solid mahogany or, as on our review model, rosewood back and side options meaning that Yamaha has the bases covered in terms of popular choices, not to mention a reasonable range of finishes, depending on model. "As ever with Yamaha, the standard of finishing is superb, almost to the point where we forget to comment on it"
We like this neck; it has enough meat to feel traditional and a good compromise of string spacing choices to suit strumming and picking. But we can't help wondering if Yamaha would have been better off narrowing the nut width and string spacing for the style in which it's most likely to be played. It's a brave move for Yamaha to eliminate all onboard control and suggest that users need either a DI or outboard preamp to get the best from the guitar: lest we forget, we're constantly moaning about over-complicated, ugly preamps in acoustics, not to mention how compromised most of them sound. 'Keep it simple' seems to be Yamaha's new approach, and we're never going to argue with that. The stiffness in the five-ply neck contributes to the guitar's generally bright, lively tones, with the ebony 'board and bridge adding to that. It's not a notably powerful or deep bass, and the overall tonal picture is very different from the lower midrange warmth of Martin's 15 Series, for example, perhaps the modern benchmark in current 'new folk' instruments. "With the LL16D, old Gibsons come partially to mind; a mid-60s J-50, for example"
That said, there's no denying the L Series family trait of impressive balance and poise. With the LL16D, old Gibsons come partially to mind; a mid-60s J-50, for example, isn't a guitar that would blow your socks off with strident power and clarity, but boy, they sound sweet and record beautifully. It is newer, tighter and brighter sounding, but it has some of that sweetness about it. It's very well sorted to sit well in a standard band mix, without too much faffing with mic position and EQ. It retains the essence of its acoustic tones and there are no obvious feedback issues, minimal quacky piezo mids and no razor-sharp highs. A few of us here do live sound from time to time, and we'd be very happy to receive this signal to the desk: it's everything you need, and nothing you don't. The only downside is that you have no onboard control whatsoever; but again, the sound engineer will be more than happy with that situation. The LL16D is the deluxe black sheep of the family, with its flashy looks, but just as you'll always need a smart black suit or a little black dress, so a quality flattop in matching dinner dress will never, ever go out of fashion.